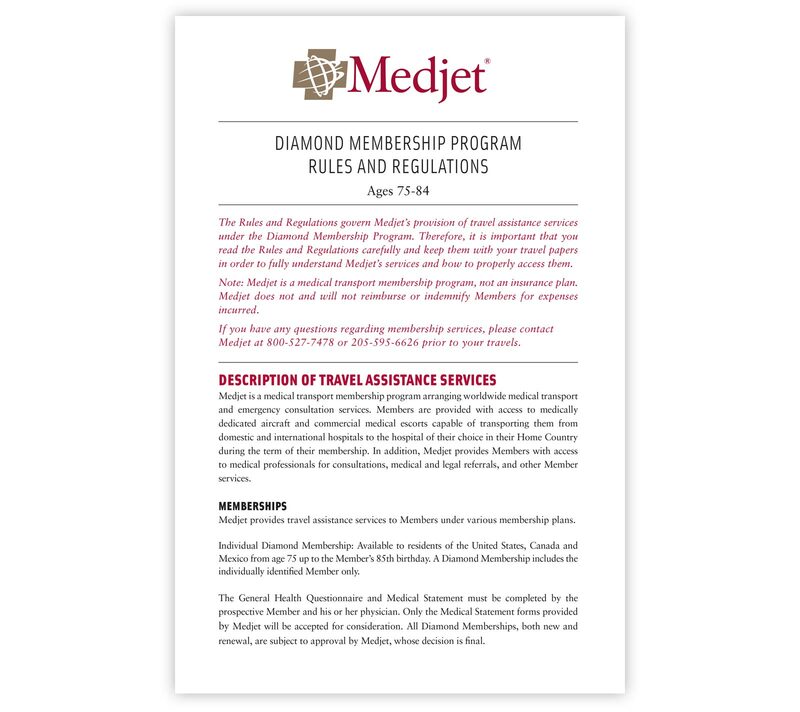 Medjet’s Diamond membership was specially designed for travelers age 75 – 84. It requires an application (plus a brief questionnaire your doctor signs off on), and may not be purchased online. This membership level is available in both MedjetAssist and MedjetHorizon options. To receive more information and an application for Diamond Membership, please fill out the form. What membership do I select? If you are renewing by yourself- select Diamond Individual. If you are renewing with a spouse/partner under 75 – select Diamond Membership + spouse/partner under 75. If you are renewing with a spouse/partner also ages 75 through 84, select Diamond Membership + spouse/partner age 75 or older. How long will it take for memberships to get reviewed? Please allow Medjet 5-7 business days to review applications. Making sure that your application has been completed correctly before you send it in will help expedite the process. Which doctor should complete the physician’s medical statement? Your primary care physician should complete pages A and B. In addition, if you have seen a specialist or been hospitalized, those physicians should complete pages A and B as well. How do I send in the application? You are welcome to either mail, fax or email the application to Medjet. Can my application get disapproved? Applications are either approved with NO exclusions, approved WITH exclusions or disapproved. If it is approved with exclusions, the member will be contacted to discuss the exclusion and to make sure the member understands and accepts the exclusion. If the application is disapproved. The member will be contacted by phone or letter. A general health questionnaire and medical statement must be completed by the prospective member and his or her physician. Member must have been seen by a physician within the last 12 months. Only the Medical Statement form provided by Medjet will be accepted for consideration. All information is kept strictly confidential. Diamond family memberships with two members ages 75 through 84 will need to submit an individual health questionnaire for each member. MedjetAssist Diamond members are limited to one medical transport per membership year.